The anticipation of waiting for your child’s arrival is like the intense level of anticipation while you’re pregnant. You don’t know exactly what’s coming, but you’re totally stoked for it anyway (along with a healthy dose of fear and nerves). When the child arrives, you fall into each other’s arms… complete strangers and yet in love already. Over the next couple of weeks you experience many phases of parenthood. When it comes to manners, nobody has ever really showed these children! So we go back to how we taught our 2 year old children… for example, if we want them to learn to say thank you, we say it for them every time. You take the time to model it in front of them every single opportunity you get. It takes a week or two, but they start catching on. It’s the same with other polite statements (Please, I’m sorry, Excuse me, etc…). When it comes to saying no, you’d better be prepared to draw a line in the sand and lovingly stand firm like you would with a 3-5 year old. Do not cave, or you’ve just undermined your own authority. They will push on the boundary to see if you crack. Both of my kids did that frequently during their preschool years. You have to teach them (just like you teach your young children) the importance of hygiene, bathing, changing clothes every day, brushing teeth, etc… At first you wonder why they don’t already do this stuff. But remember, your own kids did not come out of the womb knowing how to brush their teeth and do laundry. You taught them as they grew! It’s the same for host kids. They just need someone to teach them. When it comes to these things, you show them how everything works, but teach them in a non-babyish way so they can also maintain their dignity as teenagers while they learn what kids in families already had the opportunity to learn at much younger ages. Moving on up to the grade school years, you have to teach them English words and phrases just like teaching a first grader. Flash cards, repetition, etc… “Cat! Dog! House! Banana!” Oh, and offer jubilant praise for any kind of success. Our first host child looked at me in shock when I told her I was proud of her… I don’t think they get that kind of praise very much. She was disinterested in learning until I got crazy happy the first time she said something in English. Children LOVE positive reinforcement. After that she asked me the word for all sorts of items around the house (probably just to see me flip out with glee and gushing praise. LOL!). There are definitely behavioral issues to deal with. Depending on the scenario on any given day, they may have “8 year old” behavior issues or “15 year old” behavior issues. Or it may be some sort of mutant mix of both. In any case, you’re suddenly thrown into the phase of parenthood that is dealing with a very emotional teenager. Lord help me! I had no experience in this area when we first hosted, but hey… I’m learning fast. As the days turn into weeks, you begin to look at pictures of day 1 compared to current pictures and realize just how far you’ve come and what a change in demeanor you can clearly see. That’s when you sort of realize, “My baby is growing up.” Well, that’s not exactly what you say, but it’s the same concept. The smiling girl who constantly says “Thank you” and is beginning to accept when you say no and skips through the house with joy is NOTHING like the child you picked up at the airport. You look at the calendar and realize just how little time you have left and remind yourself not to waste a single moment. As you reach the final days, it’s like getting ready to send your grown child off to college. It’s a cruel world out there, no matter where you are on this earth. Your precious child is going out from under your roof, and you have to let go and commit them into God’s hands for safe keeping. You pray you made a difference in their lives and that they will remember what you’ve taught them about life and the God who loves them. Then you give hugs and kisses and let go. 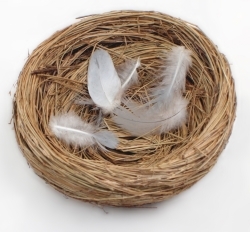 It’s a 5 week crash course in parenthood, and then you come home from the airport, collapse onto your couch, look around, and realize there’s one more phase of parenthood left… the empty nest. It’s a feeling of deep love for that child you never saw coming…. As a hosting family that has hosted three times, this is SO good. I think the part that I never expected when hosting older children is how exhausting it is in every way: physically, spiritually and emotionally. Yet worth every bit of it.